Happy Wednesday!! It is the middle of the week and today is the third day of the fun Release Party at My Craft Spot. Have you been checking in to see all the wonderful projects and the fab projects done with the new stamps this week?? 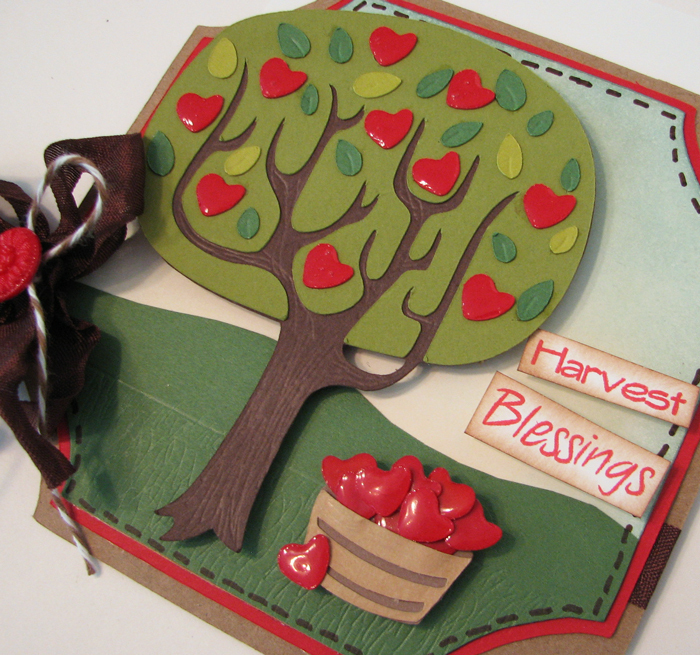 Today, I have a card to share with you that uses the new Happy Fall! stamp set that is being previewed today at My Craft Spot. I used my Cricut and Gypsy Wanderings to cut the card shape and Country Life to cut the images and the lovely "Harvest" and "Blessings" stamps from the great Happy Fall! stamp set. I used hearts instead of the apples on the tree and in the basket (which actually had a washboard, but I cut that part off). I added some pen stitching to the background and I used glossy accents on the hearts and tied it all up with some yummy chocolate crinkle ribbon and twine and then finished it up with a cherry red button. The texture on the grass and on the tree, I added with a small tipped stylus. 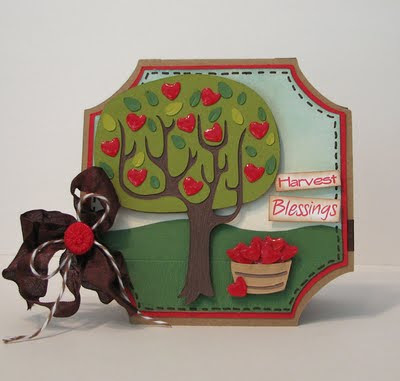 Have fun and don't forget to check back on Friday for a fabulous blog hop and a chance to win some stamps right here!! Oh my.. This is awesome!! I totally LOVE the hearts!! The shaped card and stitching is PERFECT!!! Great job!! I love this card! The attention to detail is perfect (grass and glossy accents). LOVE this card.The glossy hearts really pop. LOVE this card...the glossy accents, the shape, the button!!! All of it!! Those glossy little hearts are the perfect touch! Way to go on a perfect project! This is such a cool card! I love the heart apples and how the Glossy Accents made them look! Darling card Amy!! Love the tree and especially the hearts!! Such a festive card for this time of year! Great job! Wow, Amy! Love the card...those hearts that you used as apples are so cleverly used and add some cuteness to the card. Beautiful like always. This is fabulous, Amy!! I love your glossy heart-apples! Soooo cute!! I love the glossy hearts on your fabulous tree! I love how you added texture with your stylus! That's incredible! I wish every tree would produce "love". So let's plant more trees, and there would be more love. Well, the card looks very nice. The edges and layers are pretty cool. Good job! Have an awesome weekend! I love the monster bag using the Candy Corn Kisses stamps. So cute!